Want to teach your kids about guns? Wondering how to tell them about gun safety rules? If you own a firearm or you want your kids to be able to shoot their own guns someday, you need to teach them about gun safety early on. Unfortunately, when it’s the right time for your kids to learn about guns it’s not always clear what the best way to go about it is. Luckily, we’re here to help. Below we’ll tell you about the 5 best tips for teaching your kids about gun safety. One of the best things you can do to teach your kids gun safety rules is to first show them your gun and walk them through exactly how it works. Instead of having a family game night one week, spend a night demystifying the process of using and caring for a gun. Let them watch you clean it, load it, and fire it. Make sure they understand everything about your gun, including how dangerous it can be. By showing them what it can do and making guns less of a mystery, they’ll start to understand the importance of gun safety. As part of showing your children how your gun works, you’ll likely want to show it to them in action as well. 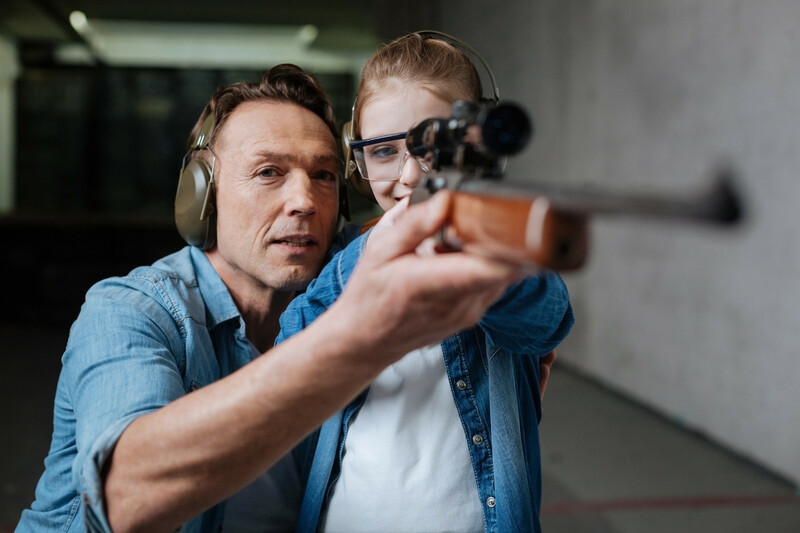 Consider taking them shooting with you at your favorite gun range to bond them with and to teach them more about guns. Let them watch you fire some rounds while you practice what you preach. When you do this, your kids will be able to see firsthand what kind of damage a gun can do. This will help them to see the parallels to the dangers it could pose to real people if they don’t keep gun safety in mind at all times. To make gun safety easy for your children to remember, it’s a good idea to have a list of “commandments” that they’re never allowed to break no matter what regarding the guns you have in your home. You may include rules on your list such as treating all guns as though they are loaded, never touching a gun without your permission, and never pointing a gun, even a BB gun, at another person. When setting the rules of gun safety and educating your children about guns, you should always make sure that you stress the importance and seriousness of it all. Always try to get across how serious you are and how serious they should be about guns and gun safety. Ensure that your kids understand the distinct differences between gun use in TV and movies, toy guns, and real guns. Ensure your kids know that they could get hurt if they don’t follow gun safety rules. Also, let them know that they can get in big trouble with you if they don’t follow the rules. If your child is old enough, you may even want to consider giving them their own gun. A BB gun or an Air Rifle can be great to start with and will give your kids an opportunity to start applying their gun safety knowledge. Make sure that they still understand the importance of safety with these guns as well. Owning a BB gun or an air rifle can set your kids in the right direction, giving them a chance to practice gun safety before they’re old enough to own a real weapon. Whatever your reason is for owning a gun, you need to make sure that your kids know how to stay safe if you have one in the home. Make sure you use these gun safety rules and tips to ensure your family takes the right precautions in the home. Looking for more ways to get closer to your family? Click here to see our list of the best family ski destinations.